It is run by an English gal who, I am convinced is part cow girl, part shaman….and whose name happens to be Sara Vaughan…well I think she just changed it to Sara Fancy! 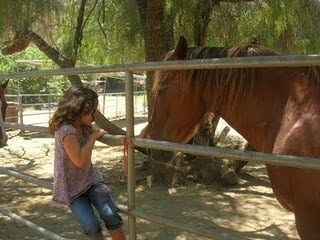 She has such a love and respect for horses and all living things…including children. On her site it says, “Children are taught how to tap into the horse’s willing nature to gain co-operation and a reciprocal relationship. There is no pressure put onto the child or the horse to do things that are stressful to the child or horse.” The experience Eva had demonstrates how true those words are. One of the things I love most about Sara is the matter-of-fact respect she had sharing with the children all her knowledge. From a Waldorf perspective, when a child enters first grade, as Eva will this year, she looks to a single point of authority and yearns to learn about the world of adults. Sara has that authority with humor, a straight forward approach, wealth of info and a spiritual perspective on her world that makes her a wonderful role model, for boys and girls alike. The day begins in her yurt, (equipped with an outhouse and a compostable toilet.) There she forms a circle with the children and gives the ground rules and the plans for the day. She might tell the histories of the various horses and share her convictions about why horses and every living being deserve respect and how it is an honor to be on a horse’s back. Then they might play tuning forks together, learn to run in a herd around the room, or have a beautiful horse-related tale read to them, choose Indian names for themselves or discuss various animal encounters they had the previous day with a snake, or bee or coyote etc. Then it is out to care for and groom the horses. With just about one on one attention, which is easy to do because the camp is limited to nine children and Sara has two helpers, she shows them all the homeopathic medicines for the horses. “Nothin’ in ‘ere is toxic,” she reaffirms. And the children smell and look at all the various natural ointments as she tells them stories of how she healed this horse and that one from the various ailments they had when they arrived in her care. 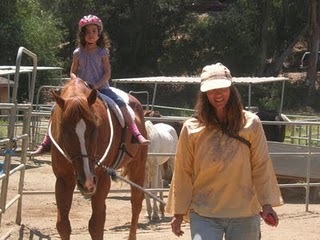 Day by day, the children deepen their appreciation for the horses, guiding them on leads with halters (Sara never uses a bit), grooming them, tending to any wounds, feeding them carrots or handfuls of hay, molding their own horses from clay, and learning to understand how horses think and feel and how human behavior affects them. “Where is the riding?” you might be asking. It is actually a special time reserved for the end of the day. The children ride one at a time on a soft pad, led by Sara or one of her two lovely assistants. Eva even got to canter for the first time, with Sara running along, huffing and puffing! But this is not a riding camp, per se. It is so much more. 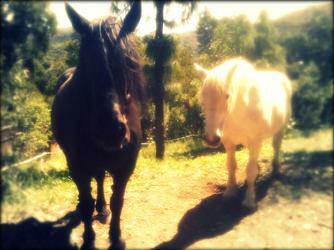 When Eva arrived, she was tentative around the horses, around Sara, around these unfamiliar grounds. By the end of the first week, she was marching around (with quiet feet, of course, so as not to startle the horses), directing any newcomers, getting bits of hay and feeding it to her favorites, or just having a tete-a-tete with Hank or Diva. From her posture to how she discussed her various opinions with Sara or relayed the day’s events at home, her confidence, not just as a “camper,” but as a little person, was deepening and growing every day as her bonds with the horses grew stronger. She and all the friends she made there shared a beautiful and fun adventure none of these children will forget any time soon. One very funny coincidence that topped it all off for Eva specifically was that Sara has a rescued chihuahua mix named Minnie…and so do we! 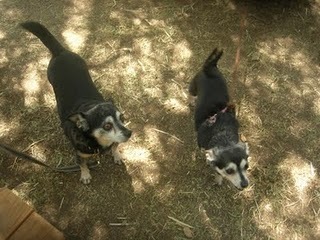 Here are the two Minnies with our Minnie on the right! This delighted Eva and the other children to no end! 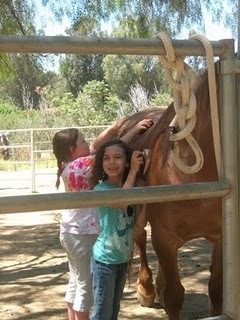 I can’t say enough to recommend the Silver Horse Healing Ranch‘s children’s programs. What a natural way to spend the day, what a relaxed way to spend the summer, what a very special experience that will touch my daughter for a lifetime. We will be back for more! Welcome! I continue my trek backwards through the alphabet to bring to you the most wonderful and imaginative treasures. They are all handmade with natural materials from…yes! the NaturalKids Team on Etsy! Once again, we are featuring a wonderful variety of artists who all work with natural materials and today, are all Waldorf-Inspired! All their shops start with an F…could that stand for open-ended “free play?? I think so! Enjoy! Fee Tartine is the home of various styles of Waldorf-Inspired cloth dolls. Johanne, is from Canada. She is a Mother, midwife and craftswoman, who is “overwhelmingly busy but literaly addicted to sewing and knitting.” Her latest, the Punk-Dorf 15″ Waldorf Inspired Doll , is a simple but sturdy one-of-a-kind doll, made from quality re-purposed materials. Donni, the creative wonder behind Fairyfolk, makes needle felted and silk treasures. She grew up in South Africa, where she had a lovely, natural childhood surrounded by animals and wilderness. She has lived in many different countries, Ireland, England, New Zealand and now, finally, America where she has settled at last. “I have a loving Kiwi husband and two gorgeous children. Crafting is how I reconnect with myself. It is the language of my soul. I came to needle felting only recently and have fallen in love with all of it… the sound of the needle in the wool, the smell of the wool, the feeling of my creation in my hands. 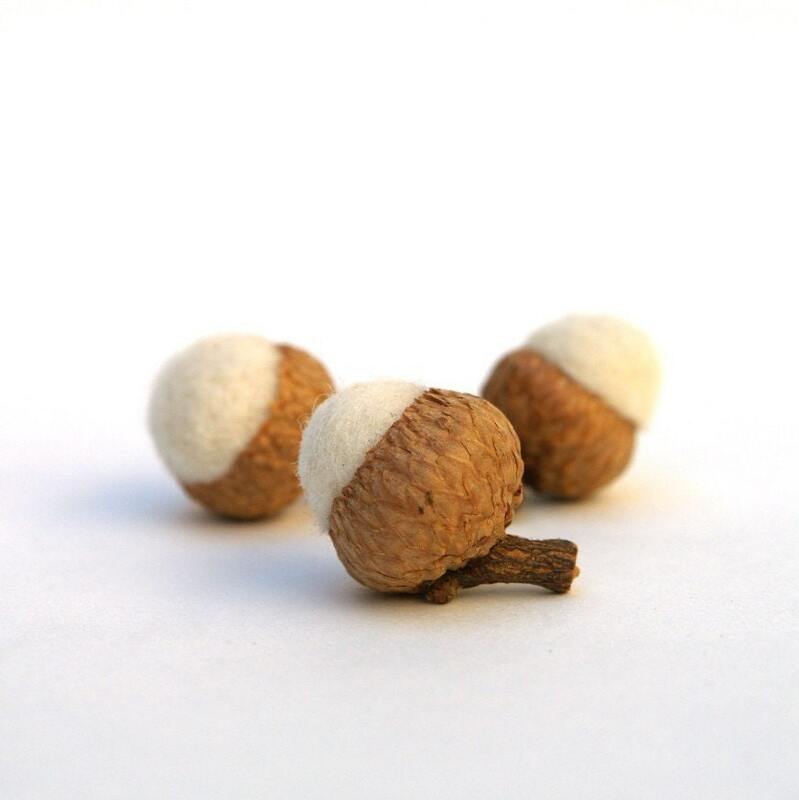 I am so grateful for the wide range and color of the wool I can work with… it makes anything possible.” Here is her latest Set of 8 Snow Felted Acorns. Free Trade Family hails from Arizona, the shop offers a wide variety of cotton and wool play foods for your child’s play kitchen or market or for imaginative fun anytime, including fruits, vegetables, ethnic foods, and sweets. Here is the latest… Cotton Play Food – Chocolate Sandwhich Cookies. Those are the featured new items for this week– from lovely upcycled Waldorf dolls to wool decor and play acorns to cotton play food play…they are all from natural materials and from the hands of folks who love nature, children and open ended toys..this is just a small sample of the quality and variety our customers enjoy from the fine crafters and artists of the NaturalKids team. Ulla is the visionary behind GermanDolls. Her shop is a wonderful resource for Waldorf style handmade dolls and doll clothing. All of the items you see in her shop are made by her from patterns she designed. She makes her dolls and doll clothes from natural fibers, wool, cotton, and felt. Here is her custom made Leaf Buddy. Finns and Flowers is a small husband and wife team family business in the beautifully small and rural community of Palermo Maine. Both are endlessly inspired by their three magical children. “We believe that children need toys that invite them to be active not only physically, but mentally as well. They need toys that are pleasing to look at and enjoyable to touch. Most of all they need toys that are fun and safe!” They don’t paint or stain the wood, but let it be in its natural form. Ten hand rub each wooden toy with either a mixture of beeswax and jojoba oil, or environmentally and child safe linseed oil to further enhance the beauty and protect the wood. Here is their Natural Heart Teether. Those are the featured new items for this week– from sweet play toys to teethers – all from natural materials and from the hands of folks who love nature, children and open ended toys..this is just a small sample of the quality and variety our customers enjoy from the fine crafters and artists of the NaturalKids team. Somewhere in beautiful Monterey, California, hails Imogen’s Garden Here you will find, among other goodies, soft Waldorf-inspired dolls, children’s clothes and PDF patterns. “I began crafting at an early age and come from a long line of potters, carpenters, and, well, crafters…I remember vividly watching my parents, grandparents and uncles create things with their hands and still own many of their pieces. Having ownership of something they made from scratch is very like holding a tangible piece of them…and makes my heart very happy….All of our clothing is made with the comfort of your child in mind. One or more of my children or godchildren has tested each style. If a garment doesn’t pass the kid test, I don’t sell it. …Dolls are double or (in some cases) triple stitched for safety and longevity of play. Here is her Anya PDF pattern for Eco-Friendly Rag Matryoshka. Harvest Moon By Hand form Scandia, Minnesota, is a stay at home mom who homeschools her two daughters, both of whom were born in China, and adopted at 11 months and 10 months respectively. She offers Windor Stars, Natural Toys and Home Decor. Her aim is to help people enhance their homes by offering beautiful natural products which are calming and uplifting; and inspire creative and imaginative play in children. Those are the featured new items for this week– from matryoshka PDF patterns to window stars to organic children’s wear…this is just a small sample of the quality and variety our customers enjoy from the fine crafters and artists of the NaturalKids team. Mother of two very busy boys (7 and 8), Alessandra or “Lala” as they call her, is the creative designer behind the Lala’s Pequenos line. When she’s not fighting off evil empires or chasing frogs out of the house, her days are spent perfecting her designs for the little ones of the world. She wanted to create keepsake items that could be passed on for generations to come. She is meticulous in her search for the perfect fabric and obsessed when it comes to softness. Lala also strongly believes it is essential to be environmentally conscious. Here is her Organic Newborn Noonie in Serene Blue. That’s it for this week– from noonies for babies to wooden dolls and puzzles small hands to egg coloring kits. This is just a glimpse of the quality and variety our customers enjoy from the fine crafters and artists of the NaturalKids team. Thanks for joining us this week and please do return again next Monday as we make our way through the alphabet with the letters I, H and G, featuring all the wonderful members of the Naturakids team on Etsy! Til then, I invite you to browse all our wonderful shops.